Quanterix Corporation, a company dedicated to digitizing biomarker analysis with the goal of advancing the science of precision health, today announced it will be expanding its single molecule array, or Simoa, technology platform portfolio to include the new Quanterix SR-Plex benchtop instrument. 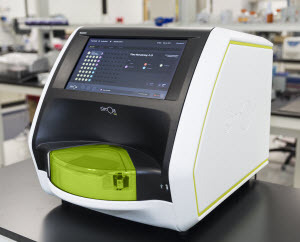 In the same way that the fully automated HD-1 Analyzer offers detection and measurement of biomarkers with unprecedented sensitivity, the SR-Plex will use single molecule measurements to assess previously undetectable proteins and can significantly reduce sample volume requirements when compared to alternative approaches, all in a benchtop format that can be easily integrated with existing automation platforms. The new platform will also be capable of measuring nucleic acids with ultra-sensitivity, without utilizing polymerase chain reaction (PCR). The first unveiling of the SR-Plex will happen today at the Next Generation Dx Summit in Washington, D.C. The SR-Plex will be part of a complete solution, including a menu of more than 70 ultra-sensitive protein detection assays, as well as a new series of multiplex assays for critical biomarkers, including the first six-plex Simoa assay for quantitative measurement of elusive inflammatory biomarkers in the blood. As illustrated in recent publications, Simoa technology also enables measurement of ultra-sensitive nucleic acid levels, including miRNA, without utilizing PCR methodologies. More than 145 studies using the Simoa technology have been published in peer-reviewed journals. This research spans several therapeutic areas such as oncology, neurology, cardiology, inflammation and infectious disease and has shown that Simoa has the potential to detect biomarkers in the subclinical state, which is valuable in the monitoring of neurodegeneration in diseases like Alzheimer’s and multiple sclerosis. Myriad RBM, Inc., the world’s leading multiplexed immunoassay testing laboratory, will begin using the SR-Plex as part of an early-access program: “We’ve previously worked with the HD-1 Analyzer and have been consistently impressed with the flexibility of the Simoa technology and the depth that this approach provides. It allows us to detect biomarkers we couldn’t previously see with other approaches. Now, as a benchtop instrument that offers multiplexing capabilities, we can optimize our in-house laboratory robotics and liquid handlers to gain significant economies of scale, including sample preservation and throughput, which helps with our bottom line costs,” said Ralph McDade, Ph.D., President at Myriad. The SR-Plex benchtop instrument will be on display for the first time at the Next Generation Dx Summit in Washington, D.C., August 15-17, 2017. On August 15 at 1:00 p.m. ET, Kevin Hrusovsky will lead a luncheon presentation titled “Convergence of Next Generation Digital Health and Biomarker Technologies is Enabling a Transformation to Asymptomatic Medicine and Precision Health”. Mr. Hrusovsky will also join leaders from bioMérieux and Novarum to participate in a keynote Technology Panel on August 16 at 12:15 p.m. ET titled “Disruptive Technologies in Lab Medicine”. Quanterix will initiate an early-access program for the SR-Plex beginning in the fourth quarter of 2017 and expects full availability of the product in the first quarter of 2018. The SR-Plex is for research use only and not for use in diagnostic procedures.